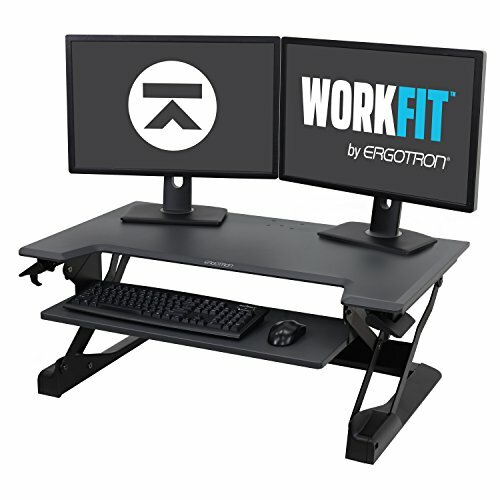 Convert your existing desk to a more comfortable, more productive sit-stand desk with the WorkFit-TL from Ergotron. WORKFIT-TL IS EASY TO INSTALL. Slide it right out of the box and you’re ready to work – no assembly required. With a footprint of 37.5″ wide and 23″ deep (95 x 59 cm), WorkFit-TL’s no-fuss installation makes it the perfect solution to retrofit a single workspace or an entire office. Have a corner desk? With WorkFit-TL, you’re not limited to pricier alternatives designed specifically for corners – place WorkFit-TL in the L-shaped corner and you’re ready to work! WORKFIT-TL IS DESIGNED BY ERGONOMIC EXPERTS. 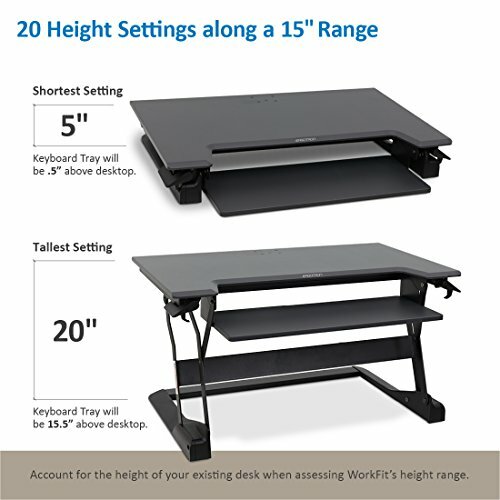 With a 15″ (38 cm) height range and easy-lift, spring-assisted Constant Force technology, WorkFit-TL places your monitors and keyboard at the perfect heights for your body to keep you working productively, whether sitting or standing. Simply grasp the side handles and adjust up or down – no time-consuming hand cranks or noisy electric motors to disrupt your workflow. Boost your comfort even further with add-on options: Dual Monitor Kit (SKU 97-904), fatigue-busting Floor Mat (SKU 97-620-060), and more. WORKFIT-TL IS BUILT STRONG AND STURDY SO YOU STAY PRODUCTIVE. Comfortably lift up to 40 lbs. (18.2 kg) to keep your equipment at your fingertips: multiple monitors, full-sized keyboard, laptop, and more. 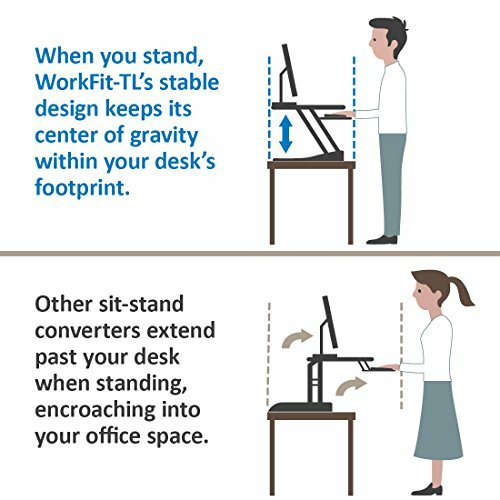 WorkFit-TL’s stable design keeps its center of gravity over your desk, so you can lift your equipment straight up and down without fear of tipping or encroaching into the rest of your workspace. WorkFit-TL is factory-tested to withstand up to 4 times its weight capacity – you can trust it to stay at the correct height without worry of sag or height-drop as you work. 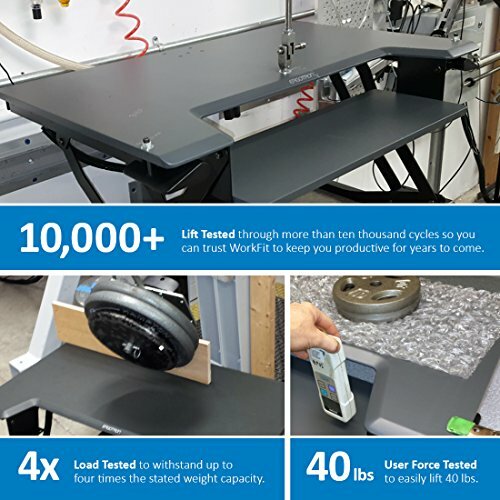 Plus, WorkFit-TL is certified in compliance with ANSI/BIFMA indoor air quality standards for VOC emissions and is protected by an industry-leading 5-Year Warranty to keep you comfortable and productive all day, every day.CONVERT YOUR EXISTING DESK TO SIT-STAND: No assembly required – slide it out of the box onto a tabletop, and you’re ready to work! 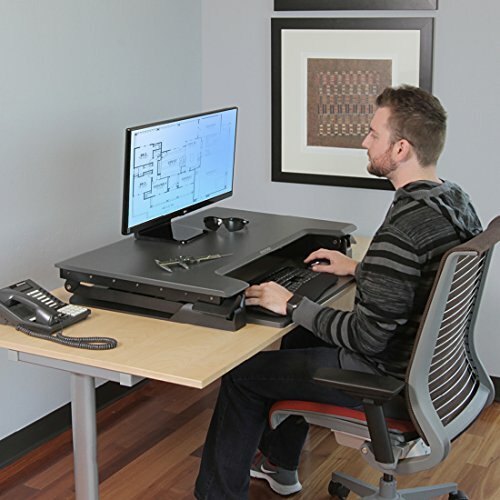 BOOST YOUR PRODUCTIVITY: Don’t be chained to your chair – you can choose to sit, stand, and give your body the movement it craves while you continue working in perfect ergonomic comfort. STURDY DESIGN THAT’S BUILT TO LAST: Easily lift your equipment with a light touch – move up to 40 lbs. (18.1 kg) straight up and down thanks to spring-assisted Constant Force technology. 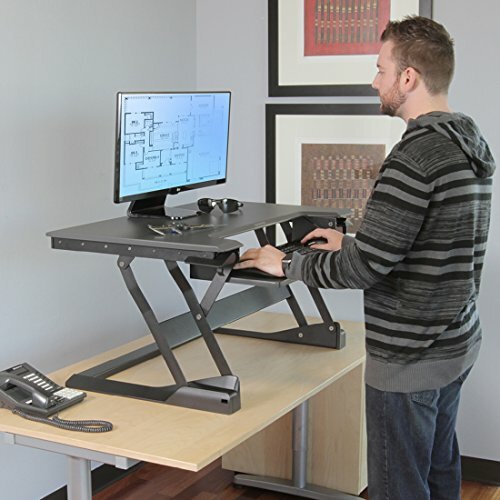 Plus, WorkFit desks won’t tip and are protected by an industry-leading 5-Year Warranty. HOW DOES WORKFIT-TL DIFFER FROM WORKFIT-T? 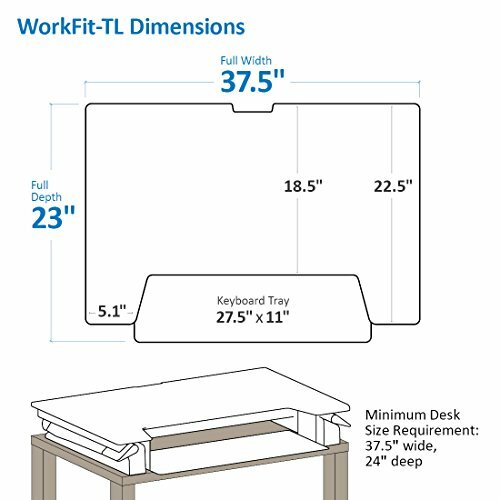 The WorkFit-TL’s wider footprint gives you more room to spread out, with 125 additional square inches (317.5 additional cm2) of surface area to hold your laptop, two monitors, phone charger, tablet, and coffee – all of your equipment is at your fingertips whether you’re sitting or standing.